We are offering such low prices on these items it "scares the crepe out of us"
Orders for crepe makers, tools, and acessories can be placed by phone, online shopping cart, or secure order form. Dvorson's Special Exclusive Offer! Buy a commercial crepe maker and receive a free sample box of Alamarra All-Natural Crepe Batter Mix. Dvorson's customers who purchase crepe griddles for commercial use are eligible to receive a complimentary 10.5 pound box of Alamarra Original Style Crepe Mix. This box of Crepe Mix adds approximately $35.00 in additional value to your purchase from Dvorson's. Your complimentary box of Alamarra Original Style Crepe Mix should arrive within a few Days of your griddle order and will help you to get started making perfect gourmet crepes every time and anytime. Please Note: Limit of one free bag of crepe mix per customer or per order (our repeat customers can take advantage of this special offer once-yearly), offer is not valid to destinations in Canada. Model # CEBIR4 On Sale! 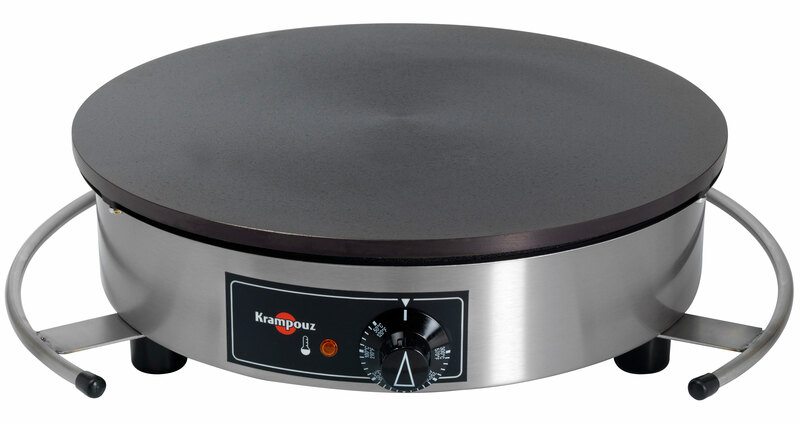 Description Finally, a Commercial* Crepe Griddle with 120 Volt electrical connection, making this model suitable for mobile catering and use in residential settings (home kitchen use), as well as Restaurant and Cafe settings. 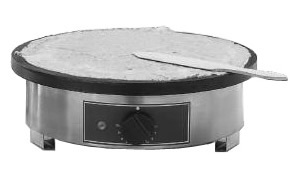 Round stainless steel frame base and 3 feet with plastic protective covers. 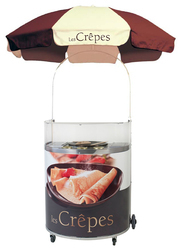 Height: 5"
120 Volt standard electrical allows flexibility to set up your crepe station in almost any setting. Removable rails are shown in image. *For Light Commercial Use Only (no more than 3 hours use per day). We now include a set of crepe tools with this crepe maker. Also qualifies for free box of all-natural Crepe Batter mix. Dvorson's Price: $479.00 $459.00 with Free Shipping. Qualifies for our free crepe batter offer. Model # CEBIF4 On Sale! Description Round stainless steel frame base and 3 feet with plastic protective covers. 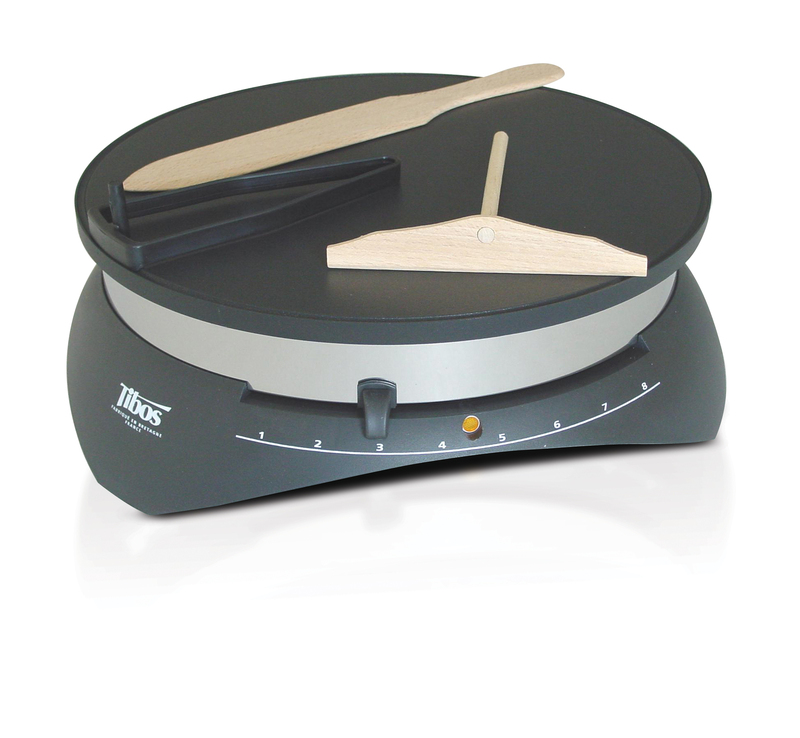 Height: 8"
We include a set of crepe tools with this crepe maker. Also qualifies for free box of all-natural Crepe Batter mix. Dvorson's Price: $761.00 $699.00 with Free Shipping. Qualifies for our free crepe batter offer. Model # 350FE Free Shipping! 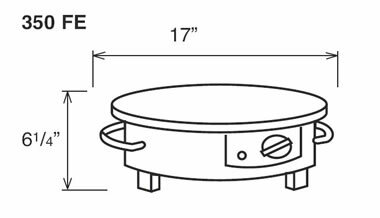 Description The cast iron enamel coated griddle plate is 13-3/4" in diameter and does not require pre-seasoning. 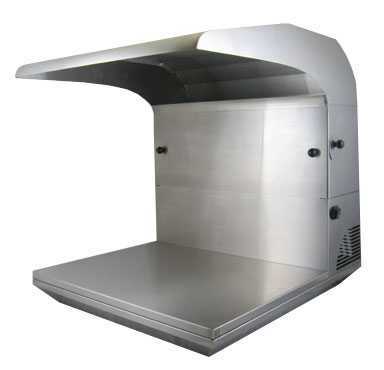 An excellent solution for cafes, restaurants, and caterers with low to medium volume. Adjustable temperature to 450°F. This model qualifies for free box of all-natural Crepe Batter mix. Model # CECIF4 Free Shipping! 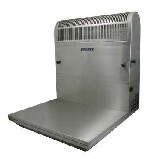 Description Square stainless steel frame base and 4 feet with plastic protective covers. Height: 8"
Model # CECIJ4 Free Shipping! Dvorson's Price: $669.00 with Free Shipping. Qualifies for our free crepe batter offer. 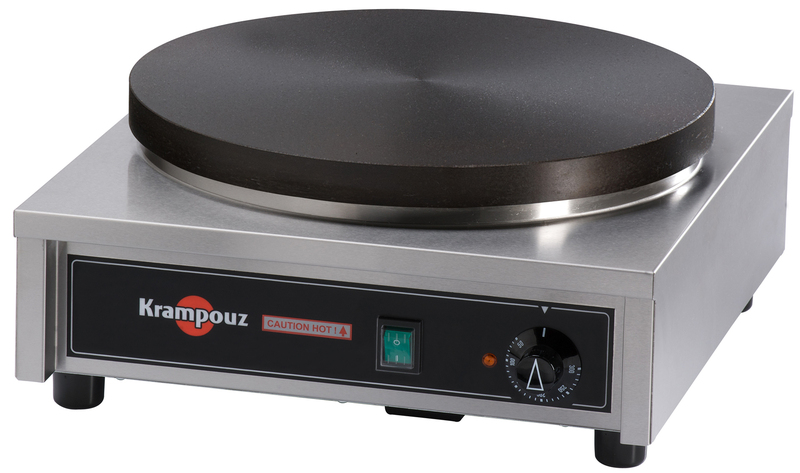 Now our most popular Commercial Gas Crepe Griddle Model. 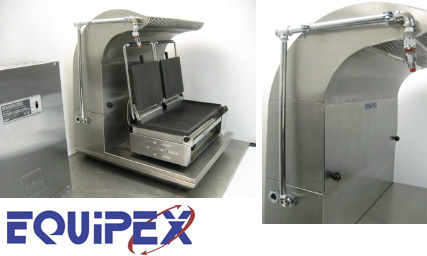 This unit is configured for propane gas use by the factory, so setup is quick and easy for crepe chefs using propane gas (LP) as their fuel source in an outdoor, or semi-outdoor environment. Description Single Griddle, round stainless steel body. Set for Liquid Propane Gas, includes Natural gas orifices. Dvorson's Price: $669.00 $625.00 with Free Shipping. Qualifies for our free crepe batter offer. Model # CGCID4 Free Shipping! 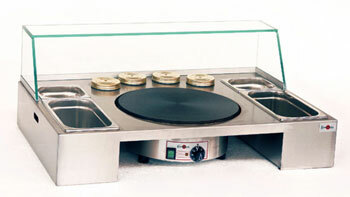 Description Single Griddle, square stainless steel body. Set for Natural Gas, includes Liquid Propane gas orifices. Height 8". Model # CGCIM4 Free Shipping! 8'' Height x 33-1/2'' Width x 17-1/8" Depth. Electric (120 Volt) On Sale Now! Free Shipping offer is valid to Contiguous U.S.A. destinations only. 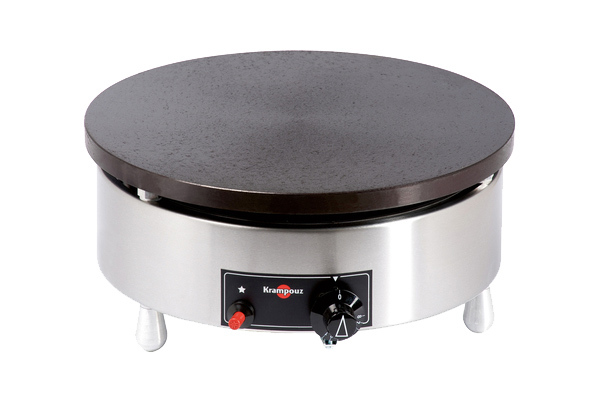 Description The cast iron enamel coated griddle plate is 13-3/4" in diameter and does not require pre-seasoning. An excellent solution for cafes, restaurants, and caterers with low to medium volume. Adjustable temperature to 450°F. 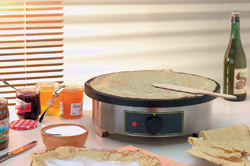 We include tools with this crepe maker. Also qualifies for free box of all-natural Crepe Batter mix. Dvorson's Price: $688.00 with Free Shipping. Qualifies for our free crepe batter offer. A complete kit that includes measured ladle, rake, spatula, recipe booklet, brush, patented Easy Crepe™ spreader device, and apron. 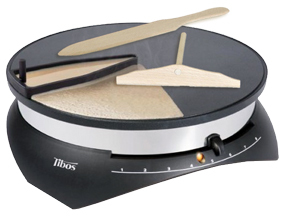 The Tibos crepe maker by Krampouz has a smooth, non-stick surface. To spread the batter evenly it comes with all the necessary accessories and includes complete instructions and recipes. With its exclusive patented Easy Crepe spreader / dispenser device, it takes a mere four seconds to spread the batter and 30 seconds to make the crepe. 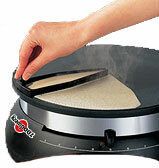 Special Offer: Dvorson's includes a free apron with the Tibos Home Crepe Maker (USA model only). Please specify apron color preferences when ordering. 6-1/4" x 36-5/8" x 23-5/8"
*Does Not Include Crepe Griddle or Sneeze Guard #AVP1 (as shown in image). Please call for pricing on other Sneeze Guards not shown. 1-877-386-7766 or see our "FlexaGuard" Sneeze Guards. Removable working surface for two CEBIF4 or CGBIP4 or CEBIR4 griddles (griddles not included). 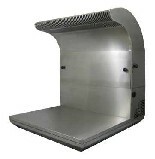 6-1/4" x 56-5/8" x 23-5/8"
*Does Not Include Crepe Griddles or Sneeze Guard #AVP2 (as shown in image). *Please call for price. Please call for pricing on more Sneeze Guard(s) not shown 1-877-386-7766 or see our "FlexaGuard" Sneeze Guards. Please contact us for a Freight Quote on this item. 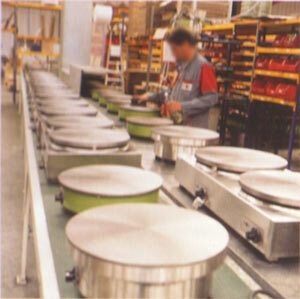 Krampouz factory in Bretagne (Brittany), France. 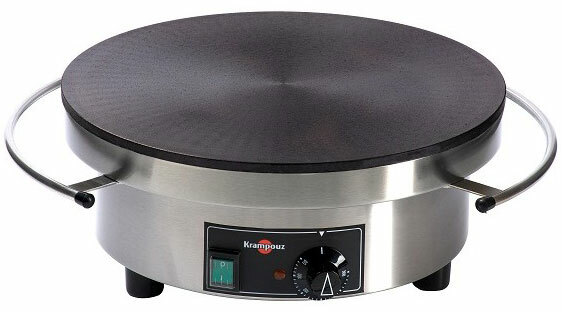 Krampouz crepe and waffle maker appliances are designed and made in Bretagne (Brittany), France. 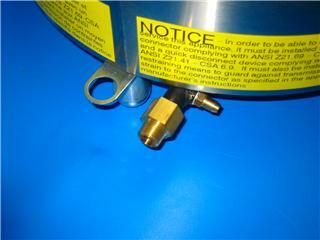 Ventless Exhaust Sytem for Small Appliances: Pre-Piped for Ansul System New! INCLUDES (installed): Nozzle(s) , Swivel(s) , Nozzle caps , Chrome dipped Piping and fittings , Fusible link detector bracket with internal conduit. 2 pinches salt- for sweet crepes, some like to add 3 Tbs. sugar and 1 Tbs. of rum. Put the flour, salt (and sugar) in a mixing bowl, dip a shaft and put the (whole) egg in. Turn with a wooden spoon and add the melted butter. Turn gently until you have incorporated all the flour (add some milk if you need but just enough). Now that the batter is soft but not liquid you have to turn very sharply so as to eliminate the lumps and obtain an homogeneous mixture. Finish pouring the milk slowly while turning. Leave the batter for at least one hour before cooking. Whip the batter. Heat a non-stick pan, put a light dab of butter in (swirl the pan to distribute the melting butter; the pan must be hot enough to hear the butter fry but not too hot for the butter must not get brown ! ), pour a small laddle of batter on the pan while swirling it to distribute the batter evenly (this is the important trick !). Don't forget crepes must be very thin ! Cook until golden brown, turn the crepe upside down and cook the other side the same way. Put it in a large plate, stuff it and fold it into 4s, or roll it. For filled crepes, plan 3 to 4 tablespoons filling per crepe. If serving warm, heat the filling before using. 1. Combine all ingredients in a blender container. For dinner crepes, add 1/4 teaspoon salt. For dessert crepes, add 1 teaspoon vanilla and 1 teaspoon sugar instead of salt. Cover and blend until smooth. If desired, flavor batter. 2. Heat a lightly greased 6- or 8-inch skillet over medium-high heat. Remove from heat. Pour 2 tablespoons of batter into center of skillet (use 3 tablespoons batter for an 8-inch skillet). Lift and tilt skillet to spread batter and coat bottom of pan. Return to heat. Cook for 1 minute or until light brown. Turn with a spatula, and cook second side for 30 seconds. 3. Slide finished crepes onto paper towels. For filled crepes, spoon filling into center; roll or fold crepe while still in the pan; slide carefully onto plate. Repeat with remaining batter, greasing skillet and stirring batter if needed. Makes about 12 (8-inch) or 16 ( 6-inch) crepes. Orders for crepe makers and acessories can be placed by phone (1-877-386-7766) , online shopping cart, or using our secure order form.